The Proof Is In . . . 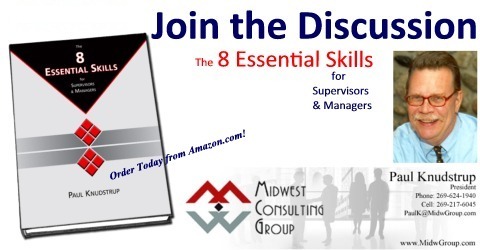 This afternoon I opened a shipment from CreateSpace – the proof for “The 8 Essential Skills for Supervisors & Managers” is in my hand. We’ll give it a final review and then . . . we go to press! More to come. It’s been an interesting week and the news is good. On Wednesday we uploaded the book – all 382 pages of it – to the printing company, CreateSpace. and received word that the electronic files were useable. Thursday morning we ordered the proof. By Thursday afternoon the proof had been created and shipped. It arrives Tuesday. That will be the final test before production begins. Once intial production is ready, the book will be available on Amazon, on our storefront on CreateSpace, and from us directly. Exciting days! Most managers can easily relate to that statement. It often seems that really important things – initiatives, projects, and ideas that could make a major positive difference – drown under waves of problems to solve and details to handle. Most experienced managers agree that they sometimes feel overwhelmed and out of control when they try to deal with the challenges and changes they face. They describe what they do as something like herding cats or grasshoppers. It’s a job that’s complex, ever-changing, challenging, exhilarating, frustrating, satisfying, and never boring. The traditional view of what it means to be a supervisor or manager has materially changed in the past decade. You may supervise a team or functional unit with a group of full-time employees reporting to you. But these days you’re just as likely to manage a variety of people working on several different projects. Some of them might be employees. Others might be employees who officially report to someone else. They might be independent contractors. And then there are freelancers who work for several different organizations. In this era of rapid change, globalization, and contract workers, you need to look beyond past notions of what a supervisor or manager does. What’s your job like? Does it fit the traditional mold or is your position and organization radically different?